First launched in 2009, the L-evolution collection is entering its third year of existence with a model that is exceptional on all levels. This latest addition to the collection is equipped not only with a tourbillon and a large date display, but also with a power-reserve indication appearing on a subdial directly integrated onto the oscillating weight. Yet another world first for Blancpain! 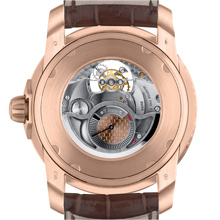 The power-reserve indication is generally displayed on the watch dial, or on the bridge side of the movement. 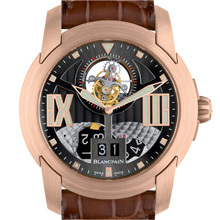 This year, Blancpain offers a third and unprecedented solution that involves indicating the power reserve on a subdial placed directly on the oscillating weight, with which it is interdependent. This new complication, already patented in 2007 and slightly modified since, is the result of more than two years’ work by the Blancpain R&D teams. Transferring the power-reserve indication to the oscillating weight has been achieved by an original and complex construction described in a separate document. Within this solution, the oscillating weight plays a role beyond that of merely transmitting energy: it becomes an information medium and frees up space on the dial for other functional indications, or simply for aesthetic reasons. This original device is incorporated within the Manufacture Blancpain 4225G calibre endowed with a 7-day power reserve. This new movement is visible through the sapphire crystal caseback and also features Blancpain’s “flying” tourbillon and double-disc large date mechanism. Available in satin-brushed white or red gold versions, the L-evolution Tourbillon Large Date features the characteristic dial of this collection, in a colour matching that of the case. Finally, the rubber-lined alligator leather strap ensures that this new milestone model is also extremely comfortable to wear. One problem with making complicated watches is how to fit a large number of indications on the limited surface of a dial. Blancpain’s Research & Development teams have now come up with a way of displaying the power-reserve indicator on the back of the watch as an integral part of the winding rotor. Power-reserve indications are provided by a planetary or differential gearing that correlates the winding rate of the ratchet with the unwinding rate of the barrel. The hand showing the power reserve is usually connected to the output of the differential. The first difficulty Blancpain had to overcome in developing this new system was to put the power-reserve indicator on the axis of the rotor. To achieve this, the staff of the differential protrudes on the bridge side of the movement. A transmission wheel takes its rotation over the winding-train bridge to the central axis of the rotor. A second wheel coaxial with the rotor, which is normally part of the self-winding system, serves to transmit the rotation to the wheel carrying the power-reserve hand through a pinion, which reverses the direction of rotation. The second problem was to make the power-reserve indication easy to read; the power reserve dial has to stay in the same position on a spinning rotor. This is achieved by adding a fixed wheel on top of the coaxial transmission wheel. A pinion reverses the direction of rotation and a supplementary wheel carrying the dial is placed coaxially with the power-reserve hand. The system thus cancels out the rotation of the dial due to the winding rotor. The third challenge was to secure the power-reserve indication when the barrel is fully wound. In this case, friction disconnects the gearing. The hand comes up against the applied buffer allowing the dial to rotate. In this way the hand shows that the mainspring is fully wound, while eliminating any possibility of damaging the mechanism. In a final touch, the appliqué is fixed on the dial so that it hides the screw securing the rotor to its axle. 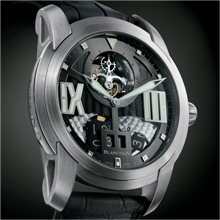 This provides the fascinating illusion of the rotor floating beneath the sapphire crystal caseback.